Taken from her home and family, shamaness Aisling McConaughey has no choice except to enter the “ghostlands” in order to learn the fate of a wealthy man’s mistress. But there is always a price to pay for the use of her power. To save the woman’s life she must summon the Djinn prince Zurael en Caym—and yield to his savage, sensual rage. Powerful forces threaten both their worlds, leaving Aisling and Zurael with an unbearable choice. Follow their hearts…or stay true to their honor and risk losing an eternity of pleasure. Set in a post-apocalyptic world where supernatural beings no longer hide their existence, and where angels and Djinn are heading for the ultimate battle over who will control Earth. 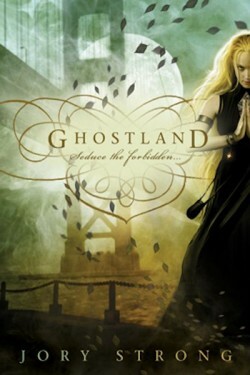 While the stories in the Ghostland world can be read as stand-alones, they are best enjoyed in order. It was nearing midnight when the sound of the door opening woke her. “Come, they’re waiting for you,” the nun who’d escorted her to the room said. It was such a small thing, considering everything that had happened and might yet happen, but the knowledge she’d soon be wearing her own clothing lifted Aisling’s spirits. “Thank you,” she whispered as Aziel reclaimed his perch on her shoulder. Aisling was led to a room. It was cold, as if it wasn’t used much and therefore wasn’t heated often. Though the nun had said the mayor waited, there were only two men in the room, one was the priest who’d come for her, the other a much older man wearing blood-red robes. The bishop left the room without another word. Father Ursu indicated a chair next to the table. “I’ve witnessed this kind of thing before. I won’t interfere.” He picked up a chalice and handed it to her. Aisling managed to contain her expression and her thoughts when she glanced down to find grains of salt in the silver cup. Aziel chattered happily as he buried his hands in the white granules and threw some of the salt to the floor. Aisling wondered again what abilities he possessed. Fear lurked deep in his eyes, as if he’d seen some of the beings drawn to the dead hours of the night. She moved to the center of the room and sat on the bare, cold floor. If she’d been at home she would have placed Aziel on her lap and enclosed them both in a circle of chalk or ash, or surrounded them with the fetishes she used when she wanted to project her astral self into the ghostlands. But here, under the watchful eye of the priest, guided more by intuition than reason, she plucked the ferret from her shoulder and set him away from her. She dipped her fingers in the salt. It was a witch’s protection, a warlock’s. She wondered if other shamans used salt to open a doorway into the spirit world. Tentatively Aisling enclosed herself in a salt circle. Though her eyes were closed she was aware of Father Ursu watching her. She was aware of another presence as well, of someone nearby and able to witness what happened. She tried to still the panic deep inside herself, felt caught in a deadly spider’s web where to struggle was to become more thoroughly entangled. She focused on breathing, on steadying the rhythm of her heart, on clearing her mind of fear. There were sigils she usually drew, but once again instinct warned her against revealing the most sacred parts of her ritual. She concentrated instead on visualizing them, on making them real in her mind as she silently called the true names of the ones who offered her protection in the spiritlands. Her heart rate tripled as the heavy gray clouds of the spirit world rushed toward her. She held herself open and the ghost winds blew through her, seeking resistance, weakness, filling her with the terror of endless death even as they welcomed and claimed her. When they calmed and settled she looked down and saw her body, there and yet not there, naked as she always appeared in the ghostlands, her hair a curtain down her back. Without warning a man stepped from the gray mist. His face bore the tattoos of a lawbreaker. He licked his lips as he glanced at her naked body. His own was covered in clothing that looked expensive. He leaned forward slightly, emphasizing the fact his hands were bound behind him as they had been in the moment of his death. A metal cable served as a hangman’s noose. It twisted around his neck then trailed down his back before disappearing into the mist swirling at their feet. “One whose name you’re not meant to hear at the moment.” He rolled his shoulders and the cable he’d been hung with shimmered, a long silver leash leading to an unseen master. The man cocked his head as if listening to an unspoken voice. “Good enough,” he said before turning and walking deeper into the gray landscape. There was no sense of time or distance in the spiritlands. They may have traveled for seconds or hours, yards or miles. There was a sense of being watched but Aisling couldn’t be certain which plane it was on given Father Ursu’s presence in the room where her body awaited her return. Heat and cold brushed across her ankles, occasionally there was a phantom touch to the back of her hand. The gray gave way to pink. The pink darkened and became blood red. Her guide stopped. “End of tour for me unfortunately.” He kicked at the red mist at his feet. “Too bad. I wouldn’t mind seeing how Elena is faring.” He tilted his head. “She’s not screaming. Could be a good sign—or a bad one.” He laughed before taking a step backward and being swallowed by the ghostlands. Aisling closed her eyes and let herself sink into the physical world as she remained in her astral self. She was greeted by the sound of chanting, by the thick smell of burning incense mixed with blood. Her breath caught in her throat when she opened her eyes and found herself in a nightmare scene of flickering candles mounted on goat heads, of dark-robed figures surrounding an altar where Elena lay naked and spread-eagled. Sigils were painted on her eyelids and lips, on her palms and on the soles of her feet. The steady rise and fall of her chest was the only indication she was still alive. The gleam of a blade being raised turned Aisling’s attention to a man next to the altar. He wore the headdress of a goat. The chanting stopped when be began to speak in a deep, mesmerizing voice. The words were unfamiliar to Aisling but she could guess their meaning, their purpose. Her heartbeat thundered in her ears. She had no true physical presence here. She was only a witness to the events. Even if she left the room and determined where Elena was, by the time she returned to her own body and conveyed the location, it would be too late. Warm fur brushed against her ankles. She looked down and startled at the sight of Aziel. Always before he’d traveled with her or didn’t appear at all. The flames of the candles flickered and reflected in his yellow eyes as he met Aisling’s gaze. Their minds touched in a way they did only when they were both in spirit form. There is a name you can whisper on the spirit winds, a being you can summon. It was her choice. It always was. But there would be a price to pay. Tell me. The ferret climbed to her shoulder. His face pressed to hers as if to ensure the name he yielded would only be heard by her. Zurael en Caym. Serpent heir. Son of the one who is The Prince. A shiver streaked down Aisling’s spine in soul-deep recognition. There was no time to question the reaction or agonize over her decision. The dark priest’s prayer climbed toward a crescendo. When he reached it the athame in his hand would plunge into Elena’s heart. The dark-robed acolytes shrieked as Zurael appeared, black-winged and taloned. With a casual swipe he severed the jugular of the dark priest and sent blood spewing across the altar. In panic the participants tried to escape only to be grabbed and killed, their bodies tossed casually to the floor as their hearts ceased beating and their souls fled. Terror and horror filled Aisling at the sight of the demon, at the destruction he wrought with so little effort. His face and naked body were human but his eyes burned like molten gold. When the last of those participating in the black mass was dead he came to stand before her, coated in blood, his expression promising retribution for being summoned and commanded.